Little Pig Robinson, published in 1930, is the last book in Beatrix Potter’s Peter Rabbit series, though it was one of the first to be written. In a letter from 1893, Potter described seeing a pig on a ship in the harbor at Falmouth, where she was vacationing, and quickly sketched an adventure for it. The pig, intended to be the captain’s dinner, steals a rowboat and escapes to the same island where Edward Lear’s owl and pussycat married and Daniel Defoe’s Robinson Crusoe sheltered. If Little Pig Robinson has a moral, it’s that an acquaintance with literary geography can be life-saving. 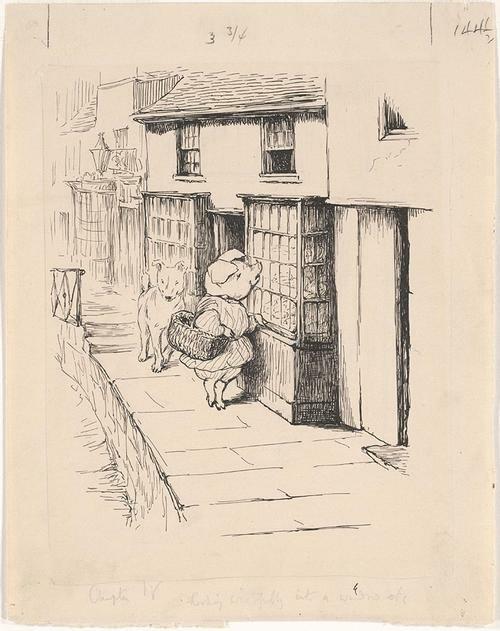 When I learned that the Free Library is home to the largest collection of Potter manuscripts and first editions this side of the Atlantic, I set out to renew my acquaintance with Little Pig Robinson—my favorite of her books as a child. Its plot is common to many of Potter’s books: an unwise and potentially edible creature wanders across the carnivorous gaze, is captured, and then rescued by a resourceful champion. What makes Little Pig Robinson different is its length. With eight chapters and over 100 pages, it is the epic of the Peter Rabbit series, allowing Potter room to depict her setting, the fictional port of Stymouth, with convincing precision. One of the book’s Goodreads reviewers wrote, "Now I wanna go to the seaside." Re-reading Little Pig Robinson, I felt the same. Stymouth—where most of the book’s action takes place—is based on several towns along the Southern coast of England. Potter’s letters and sketches of Dorset, Devon, and Sussex provided the sights and scents and textures of her fictional seaport, with its "stony shingle littered with seaweed, whelk shells, and dead crabs," its "smell of ropes and pitch," and its "forty-three steps, rather dark and slimy," leading "between high backs of houses" from Stymouth Market to the harbor. On his journey to Stymouth, our hero, Pig Robinson, hears many warnings from well-meaning onlookers. When he arrives, the warnings continue—along with predatory taunts from a man in a pie shop and a suspicious invitation from the window of a pub. Naïve young livestock face many perils in a bustling port filled with innkeepers, butchers, hungry sailors, and, most fatefully, one smooth-talking ship’s cook. 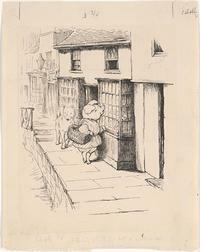 Quaint and creepy, Potter’s depiction of her ominous coastal town and its residents had me, in all seriousness, thinking of other masters of seaside menace, like Graham Greene, Daphne DuMaurier, and Alfred Hitchcock. Stymouth is a great setting for a suspense yarn. My favorite passages of Little Pig Robinson concern a watchful secondary character, Susan the cat, who takes an early stroll through Stymouth encountering all the characters that will later play a role in the book, including Pig Robinson himself—innocently scampering on the deck of a ship in the hour of his greatest jeopardy. Susan catches the eye of another cat, who gives her an ambiguous wink from his omniscient perch in the ship’s rigging. Does the wink signal the other cat’s awareness of the fate that may befall a trusting pig on shipboard? Or is it to reassure Susan that he has the matter well in hand, and will be Pig Robinson’s rescuer? At end of the first chapter, Susan heads home from her day’s errands and sits "a long time by the fire… considering many things… and the yellow cat on the ship and the pig." Though she is largely absent from the rest of the story, Susan’s point of view becomes the point of view for the entire book, making her like a classic movie narrator wryly reporting a narrative while unseen. That I keep reaching for filmic parallels to describe this modest book may say something about its sustained mood, deft pacing, and cinematic visuals. Quentin Tarantino describes a film you revisit just to linger with its characters and setting as a "hang-out movie." I can see that Little Pig Robinson could become a "hang-out book" for me. The well-chosen details of Little Pig Robinson’s locale and the skillful way Potter builds suspense through its pages have given me a renewed appreciation for her work. As a child, I liked Potter as a storyteller; as an adult I admire her as a masterful writer.